Ever since Krew was born, my dedication to working out has been up and down, up and down. I will be super dedicated for a week or two, then I'll do no sort of exercise whatsoever for a week or two. Although I realize that some exercise is better than none, this constant changing cannot be overly beneficial for my body. My muscles never have time to build up strength or endurance. There is never a lasting benefit. Just an exercise high for a week or two, the feeling that I'm doing my body good, then a total loss of motivation the first time I miss more than one day of working out. This week and last week have been no exercise weeks. Same for the week before that. I am not proud of this fact. My biggest issue? Time. Trying to figure out when to work out just seems like much too big of a problem most days, and so I tend to just skip out instead of squeezing it in. Between driving home from work, getting Krew from daycare, feeding him, bathing him, cooking dinner, eating, and whatever nightly activity is planned (Bible study, church life group, etc. ), most evenings are a bit tight. So my 1% change for this week is to start exercising at least 3 times per week. I am not going to put a time or endurance requirement on it yet. I'm just going to say I have to exercise. Whether that be elliptical, a run, a bike ride, or even just a walk with a friend, three times per week I am to get my body moving. And I figure three times per week should be attainable. I do not have Bible study or life group every night. Yes, other nightly activities come up, and I do need time to go grocery shopping, clean, edit pictures, blog, run errands, etc. But I should be able to fit in three days of working out, if I plan it right. So no more excuses. Exercise, you and I are about to get reacquainted. And I'm going to need to pull God in on this one. (As I should be doing with everything in my life. Alas, I'm on a spiritual journey and haven't arrived yet.) I'm going to pray that He would provide me with the time management, wisdom, and motivation needed to fit in my exercise. And I know He'll do it, because I know that it's His will that I take care of my body and stay healthy. If you'd like to send me some motivation and accountability throughout the week, please do so! How about you? How's your exercise routine these days? 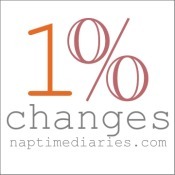 This post is linked up with 1% Changes at Naptime Diaries. Check it out if you'd like to join in!